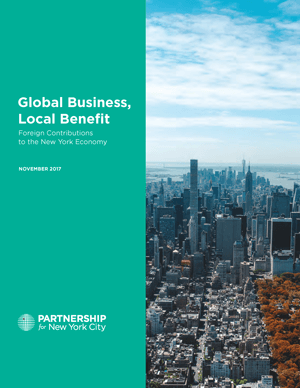 The Partnership’s “Global Business, Local Benefit: Foreign Contributions to the New York Economy”, analyzes the economic contributions of foreign international business operations to the city and state with recommendations for diversifying and expanding Foreign Direct Investment (FDI). New challenges and opportunities prompted the Partnership for New York City to revisit and update its study of FDI impact on the local economy that was initially published in 2008. For this new report, the Partnership has joined with global consulting firm A.T. Kearney to conduct interviews, research and analysis in order to assess the current status and future trends for FDI in New York. Today, FDI represents 11 percent of the city’s GDP, about $81 billion, and foreign companies directly employ 298,000 workers in the city—7 percent of total employment. In the remainder of the state FDI represents 6 percent of GDP and employs 225,000 workers – 4 percent of total employment. *FDI dependent workers tend to be in industries with above average productivity. Technology is the fastest-growing FDI sector, increasing an average of 25 percent annually over the decade. Fintech, digital media and life sciences are the verticals attracting the most investment—making it likely that resources dedicated to capitalizing on these sectors will spur the greatest economic activity. New York City receives more FDI than any other U.S. city, but it trails international competitors, like London and Singapore. Businesses come to New York for the talented and diverse workforce, proximity to customers and innovators, the sound regulatory environment and good quality of life. However, more restrictive federal immigration policies, “America First” procurement and trade policies, high corporate and personal tax rates and New York’s aging transportation infrastructure could discourage FDI. New York City and state have taken some steps to attract new and innovative foreign businesses. But to optimize FDI, New York will need to double down on its outreach and promotional efforts and do so quickly while the economy is strong and attractive to foreign investment.